To view Bert in the boat, please click here. This photograph of Bert Bushnell is picked from ‘Dickie’ Burnell’s book Sculling: with Notes on Training and Rigging (1955). The photograph was also published in Burnell’s Sculling for Rowing (1968). The other day, the local newspaper in Henley-on-Thames, the Henley Standard, reported that Bert Bushnell, the oldest surviving rowing gold medalist, had died on the 9th, at the age of 88 years. Bushnell (b. 1921) won the gold in the double sculls together with Richard ‘Dickie’ Burnell (1917-1995) at the 1948 Olympic rowing events held in Henley. Bushnell and Burnell were the two best single scullers in Britain after the war. They were thrown in a double only six weeks before the Olympic races began on 5 August, 1948. At first they seemed to be a very odd couple. The 31-year-old Burnell was a giant at 6ft 4in, educated at Eton and a winning Blue at Oxford, while Bushnell, 26 and only 5ft 9in, was educated at Henley Grammar School. In an interview some years ago, Bert Bushnell revealed that, after their third or fourth outing, they had a couple of arguments. Bushnell wanted to re-rig his riggers as they were rigged for a much heavier oarsman, but Burnell told him not to touch the boat. When Burnell walked off, Bushnell re-rigged the boat and that did the trick! Bushnell was rowing bow and Burnell stroke, or as Bushnell puts it in the article: “I was on the bridge and ‘Dickie’ was in the engine room.” In the interview Bushnell also made public that they deliberately lost their first Olympic race against the French boat, as they did not want to meet their main opponents, Denmark, in their semi-final race. Through an easy repecharge and semi-final, the Brits met the Danes in the final. At one point during the race, Bushnell saw the anxious face of the Danish bowman; Bushnell called out to Burnell, “Now!”, and they spurted away from the Danes and won with two lengths. A year later, the Danes beat the British double at the Henley Royal Regatta. What the British newspapers also like to tell about Bert Bushnell is that he befriended the American sculler Jack ‘Kell’ Kelly, Jr., and actually asked Kelly’s sister out on a date. At that time she had dreams of becoming an actress, she told Bushnell when they were walking on the towpath along the river. A couple of years later she went to drama school, and would eventually hit the big screen. Her name? Grace Kelly. Bert Bushnell’s Olympic gold medal is now kept at the River and Rowing Museum in Henley. Talking about rowing medals, to be really honest, during my active time as a competitive oarsman in Sweden, I did not win any grand pots or medals. I did, however, on a few occasions, receive marks of honour for valuable work in the service of the sport on club, regional, and national levels. Above are two of the medals I was given. The one on the left is my club’s highest honour, Malmö Roddklubb’s gold medal, showing the seal of the city of Malmö, and the band in the colours of the club, blue and white. One of the regulations for this medal is that it can only be given to someone who has received the bronze and the silver medals, but in my case, it seemed, the club committee made an exception. Earlier the same year, 1993, I received the medal on the right, För Tapperhet i Rodd anno 1993 for my work with the Boat Race between the Universities of Lund and Uppsala. This race is equivalent - well sort of - to the races between Oxford and Cambridge, or Yale and Harvard, as it is between the two oldest universities in Sweden. Before this year, the medal (‘For Bravery in Rowing in [the year] 1993’) had never been handed out, nor has it been offered to anyone thereafter. Of course, this piece of tin is an academically feigned curiosity that different intellectual, literary, sport, etc. groups at the University of Lund furnish among the students and researchers. The medal was handed out to three of us chaps who had coached the crews, organized the race, supplied the boats and the manpower to see that the race was accomplished without any obstruction, and to raise awareness on a high university level which allowed us to end the race day with an ostentatious tail-coat banquet at the Academic Society’s ‘castle’ in the middle of the medieval small town of Lund. After dinner, and rather tipsy, I have to admit, I received the medal in the men’s loo, together with my two accomplices. Tim continues, "a photograph [on the left] of Frederick Dawson of Mellish Street, Isle of Dogs, waterman and lighterman, is showing him in his rowing vest, standing beside a prize cup and wearing the prize medals won in rowing competitions. He was bound apprentice as a waterman at Wapping from 1877 to 1884 and later won many rowing prizes, including the Veterans Cup in 1904. - Date: c. 1895." Tim, who is not only a rowing historian, but also a collector of rowing artefacts, writes, "in my collection of rowing memorabilia I have an example of the only Waterman’s medal still issued. Until 2000, the winner of the Doggett’s got the Coat and Badge and the rest of the competitors got nothing. To celebrate the Millennium, the Fishmongers’ Company decided to give miniature Doggett’s medals to all participants, silver for the winner and bronze for the rest. This was so successful that the practice continues." "As an aside," Tim continues, "we must remember that, until the 1939-1945 War, there were many other Coat and Badge races, often run as an event within an otherwise amateur regatta. London RC warded (I think) a blue coat. A Richmond Regatta Coat and Badge from 1921 is in the possession of Auriol Kensington RC (on the left). The 1920s cutting from The Times newspaper shows that even the fairly lowly Hammersmith Regatta had one of the splendid items as a prize." The National Maritime Museum in London has some beautiful rowing stuff. "At the Eastern Thames Regatta of 1902, M.J. Mears won this gold medal [below; photo credit NMM] together with a waterman’s coat and a silver arm badge," Tim also mentions. Many thanks to Tim and Chris for your thoughts and input. 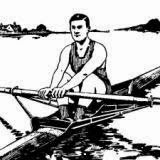 Peter Mallory's "Evolution Of The Rowing Stroke"
Yesterday on Row2k, renowned rowing historian Peter Mallory published yet another installment of his gigantic work Rowing and Sculling: The Comprehensive History (work title). 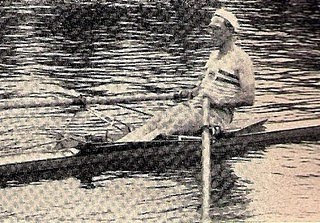 The latest part is about the American Olympian Conn Findlay (see picture, which I borrowed from The Rowing Hall of Fame web site). 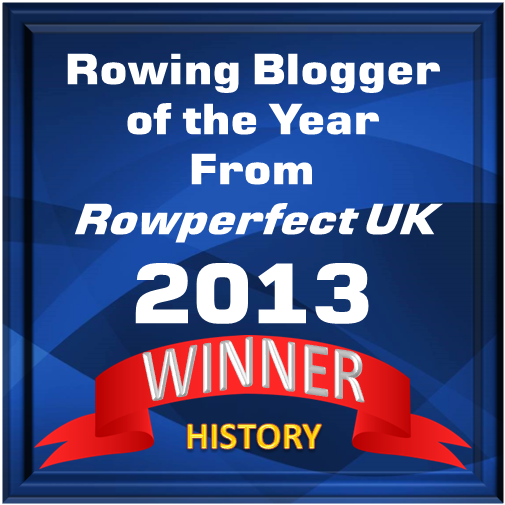 To read Peter Mallory’s article on Row2k, please click here. 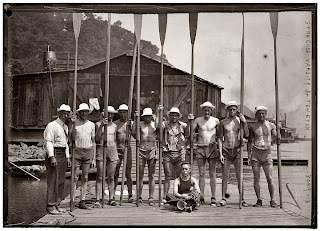 One of my favorite photographs from the Shorpy archive is ‘Jocks in Socks,’ which is showing an eight of the Potomac Boat Club on 20 September, 1919. I do not know what race the crew won, but the oarsmen look happy for the prize ‘pot’ standing on the right. Anyone browsing around the Shorpy photo archive can leave comments which are posted below the image. 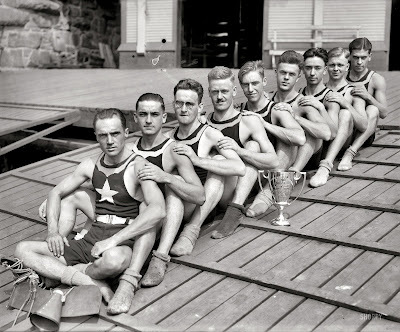 This picture, called ‘Jocks in Socks’, has quite a few of funny comments, especially for a rower. Most of the people leaving comments have no idea how to row, or the rowers’ ‘dress code’, so the oarsmen’s wet socks create a little stir, together with whom is the ‘hottest’ oarsman… To read the comments, please click here. 1 May, 1926. 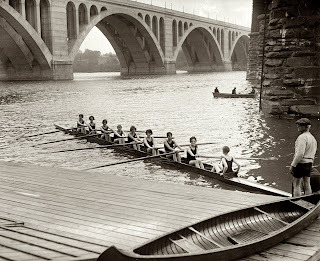 Washington, D.C. Eight-oar shell crew of the Capital Athletic Club on the Potomac between the Francis Scott Key and Aqueduct bridges. Cornell varsity crew at Poughkeepsie. June 18, 1911. Rowing historian Tim Koch of Auriol Kensington RC in London has been busy during the Holidays. 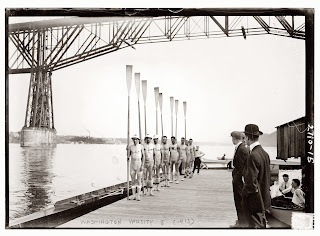 He has found another photo archive with beautiful, old rowing pictures. 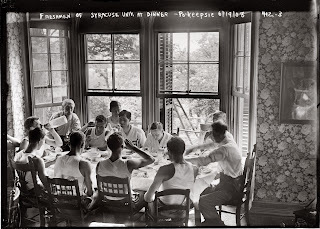 In an e-mail, Tim writes: “I have recently discovered a delightful archive photograph site at shorpy.com They have high resolution pictures often taken from 5x7 glass plate negatives so the detail is marvellous.” Of course, he typed in ‘rowing’ in the search and came up with some great pictures. 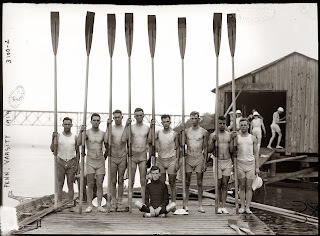 Syracuse varsity crew team at the boathouse with coach Ten Eyck circa 1908. 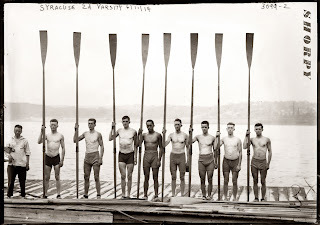 Syracuse second varsity crew, June 11, 1914.